December 2, 2016 – The Society is pleased to announce that Stacy Ashton has been hired as Provincial Program Coordinator, Volunteer Resources. She will be responsible for developing and rolling out a province-wide volunteer engagement plan focusing on volunteer recruitment, support, retention, management and recognition. “We are excited to have Stacy on board to enhance and formalize the Society’s relationship with our dedicated volunteers. 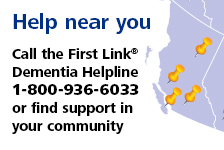 We have 400 volunteers who, alongside our 85 employees, comprise a community of courage, supporting British Columbians affected by dementia as well as their care partners,” says Director of Finance and Administration, Bark Kong. Stacy has been the Executive Director of Community Volunteer Connections, the volunteer centre serving the Tri-Cities and New Westminster, for over 10 years. Stacy is also well connected with the volunteer sector in British Columbia. She is the Vice President of Volunteer BC and has served on its Board for 6 years. Stacy is a skilled trainer and has put on many volunteer sector workshops locally and provincially. With her professional expertise, she has worked on many industry projects including co-development of a curriculum to create “culturally welcoming” volunteer programs with MOSAIC, SUCCESS and Immigrant Services Society, Volunteer BC, Legacies Now and the Administrators of Volunteer Resources BC (AVRBC). She was recently nominated for AVRBC’s 2016 Impact Award for Exemplary Leadership. In 2015 Stacy worked with the Society in a consulting role to conduct a review of its province-wide volunteer program. In this, she developed key recommendations for volunteer recruitment and recognition. “Earlier this year I had the chance to speak with so many staff members about volunteer engagement and was struck by how enthusiastically everyone participated in the review – and by how passionately they spoke about the role of volunteers. I am thrilled to join an organization so committed to excellence in volunteerism,” says Ashton. Learn more about volunteering with the Society.